The Vikings were very clean compared to the other cultures of their day. In fact, according to cleric John of Wallingford, the Vikings combed their hair daily, changed their woolen undergarments often and bathed each week. Viking Answer Lady also states that archaeological evidence shows that the Vikings made their own soap. Their soap contained few ingredients but gets the job done. Making your own Viking-style soap at home is a fun historical experiment as well as a follow-up activity for students studying ancient history. Parents or teachers should supervise young children. Peel the skin from about 24 conkers with a sharp knife. 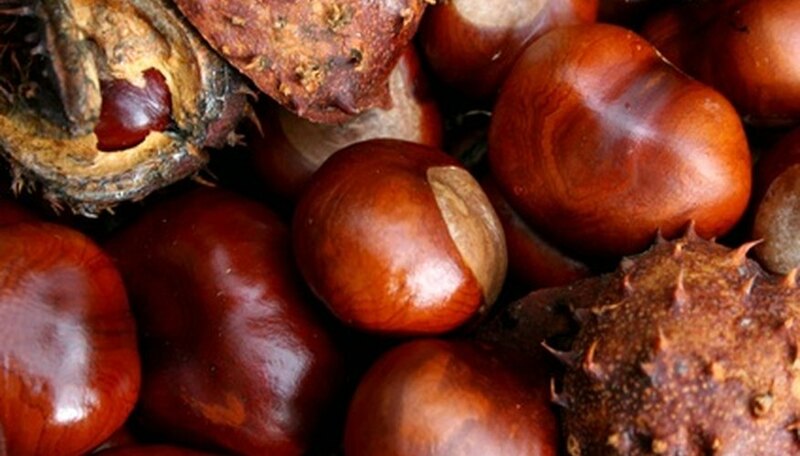 Conkers are a kind of horse chestnut and are easily available in the fall from trees or from gourmet nut stores. Discard the brown peels and rinse the white innards gently. Grate the white conker innards with a cheese grater. You can also dice them, but grating is faster and results in uniform pieces. Press firmly and grate slowly to avoid injury. Fill a bowl with warm water and drape a piece of cheesecloth over it, pushing the cloth down so it touches the bowl’s bottom while hanging over the sides of the bowl. Pour the grated conkers into the water and let them soak for an hour or two. Gather the edges of the cheesecloth into a bundle and pull it out of the water. Squeeze the conker pieces to remove excess water and then pack the soft pieces into a rectangular soap mold. Press firmly for best results. Let the soap dry in a warm, dry space overnight. Turn the soap bars out and try them in the shower or bath.